Images: Candy Chang, Before I Die, New Orleans, 02011. Last month a remarkable book was published by Designmatters at ArtCenter College of Design –– LEAP Dialogues: Career Pathways in Design for Social Innovation. In the preface, editor Mariana Amatullo states that the work is "a first-of-its kind resource" directly addressing "change[s] in how design is taught, practiced and integrated into organizations, why these changes are happening, what is needed to support these new practices, and how designers can pursue these new career pathways". With 84 contributors across many themes, it's an impressively wide-ranging, substantial, and I might add, beautifully designed volume. I'm thrilled to have a piece in LEAP Dialogues in the form of a conversation with artist Candy Chang, moderated by designer Bryan Boyer, who is also one of the collection's co-editors. Bryan Boyer's wonderful stuff has appeared here at The Sceptical Futuryst before; he has since spent years working on pathbreaking projects and approaches in strategic design (e.g., In Studio: Recipes for Systemic Change, 02011, pdf). Candy Chang's work includes marvellous participatory public projects such as Before I Die and I Wish This Was, as well as contributions to the Hypothetical Development Organization, a collaboration with Rob Walker and others which I delightedly backed on Kickstarter years ago, and regularly feature in talks about guerrilla futures practice. Our dialogue appears in the book under the title "Impacting the Social". Bryan Boyer: You both do projects that are performed in the real world, in the city. Why is this important to you? Stuart Candy: I work across settings and formats—museums, galleries, boardrooms, conferences, universities, city streets. Operating in diverse sites from project to project is more important to me than any one project by itself. To my mind, all contexts of deployment are “real world,” although each has its own affordances, limitations and publics. The same goes for different media—online game, workshop, installation, mailout, design jam, short film and so on. To riff off Marshall McLuhan, each medium is a different massage. These different contexts of encounter, and alternative ways of massaging those contexts, are not merely interchangeable aesthetic options but design parameters: how would you like to massage those you wish to engage? Experiential futures practice is location and medium agnostic because it is more about enabling futures than using or advancing a particular mode of expression. Anything that you can cause to happen to, with and for someone is, in principle, fair game; the entirety of experience, the whole of the sensorium, is the canvas or design space. The term “experiential futures“ tries to convey this encompassing, transmedia idea of the range of options at our disposal. The corollary is that each intervention within the practice must be highly specific to topic, site, time, audience, etc. What‘s interesting to me about urban settings is that they are less scripted. I find it important to be prepared to use unscripted places because most people, thoughts, decisions aren‘t necessarily happening where one has an invitation. When there is something that people should perhaps be considering, and they aren‘t aware of or able to enter the museum or workshop or boardroom or town hall where the conversation is officially convened, it can be useful to instead bring the conversation to them. This is how our “guerrilla futures“ practice emerged. Formal, solicited projects often encounter roadblocks, and since you have to adapt to constraints in any project, it can be interesting to work with “found” challenges and opportunities instead. Candy Chang: I’m interested in how places shape us. I studied urban planning and at the same time I made street art, which led me to think more deeply about public spaces. In a built environment where citizen’s flyers are illegal yet businesses can shout about their latest products on an increasing number of surfaces, we need to consider how public spaces can be better designed so that they’re not necessarily allocated to the highest bidder, but also reflect our needs as a community and as individuals. The places we share have a lot of potential to help us connect, reflect and make sense of our communities and our lives together. William Whyte’s The Social Life of Small Urban Spaces encouraged me to trust my real world experiences, and making street art gave me the moxie to just try things out and see what happens. SC: One doesn’t really get anywhere very interesting with futures until one starts to entertain possibilities that deeply challenge current ways of thinking. I’m invoking the spirit of philosopher Alfred North Whitehead here (“It is the business of the future to be dangerous”) as well as my mentor, Jim Dator (“Any useful statement about the future should at first appear to be ridiculous”). A company may be facing some change in the market that no one in it recognizes; a government may need help even to see, let alone respond to, unexpected shifts in the political landscape. In any case, the “dangerous conversation” confronts that which is uncomfortable and vulnerable, and therefore marginalized, but potentially transformative. Likewise for other kinds of community, and for individuals. Creating a safe space for that means first of all finding ways to suspend the very powerful reflex of avoiding such sensitive topics. One of our earliest experiential futures projects was for the State of Hawaii, almost a decade ago, to kick off a sustainability planning process across the islands. Together with Jake Dunagan, and with the help of others at the Hawaii Research Center for Futures Studies, we immersed 550 people, ordinary citizens and elected representatives alike, in four alternative versions of the islands in the year 2050. One of the four was set in the wake of a global economic implosion in the 2040s, followed by an interval of chaos before the United States military intervened to maintain law and order. With the old economic and political regime discredited, they reinstated the monarchy that the U.S. had overthrown in 1893. As an experiential scenario, then, participants entering the room found themselves cast as climate change refugees being naturalized as citizens of the so-called “Democratic Kingdom of Hawaii,” a military governance regime with a veneer of local culture. Here the experience provided a container in which some potentially discomfiting prospects could be engaged: you’re already in the scenario by the time the rational mind starts to mount intellectual or political objections. As we say, it’s better to be surprised by a simulation than blindsided by reality. Such a conversation may be difficult, but it can’t hurt you nearly as much as not having it can.At other times, offering hospitality to dangerous ideas can take the form of adopting processes designed to include people and elicit views that might otherwise (if often unintentionally) be left out. For many years I’ve used Open Space Technology, a participant-centered way of running meetings of almost any size, and organizations like the engineering firm Arup, as well as the Singaporean government, the leadership of Oxford University, and the team behind the regional Burning Man event in Australia were all able to overcome initial discomfort with the emergent character of the process to explore their potential contexts and choices more freely and more effectively than usual. BB: Who are your projects for? CC: They’re for everyone—or at the very least for me! They’re a way to satisfy my curiosity. My projects are more psychological now, but they started out very civic-minded. When I lived in New York City, I learned about Jane Jacobs and how she rallied her community to prevent the Lower Manhattan Expressway from being built in 1962. It still shocks me to think how different New York would be today if the Lower Manhattan Expressway happened, because the “slums” Robert Moses tried to clear out are now some of the greatest neighborhoods in the city. It made me think about all the cities that could have been, and how all the cities that we have today depend on who gets involved. When we make democracy more accessible, we make places that are more loved, more cared for and more meaningful to us for the rest of our lives. If we believe in greater democracy, our unbridled creativity is now required to design the situations in which this can happen. That’s what I like about Stuart’s immersive, thought-provoking scenarios for residents to contemplate and kick around and challenge. It’s fun and engaging. There was a lot of talk in my urban planning classes about participatory planning as if we were holding the doors back to an excited, well-informed mob. In reality, there is no crowd on the other side of the door. Many people have an ambiguous understanding of civic processes, and many others are simply turned off by them. I’ve been to many community meetings that are so dreary, only the angry neighbors are excited enough to show up. 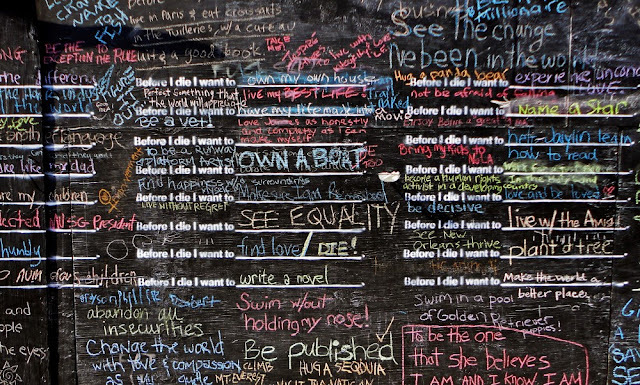 There are a lot of opportunities to re-imagine civic engagement so that people are inspired to get involved in shaping the future of their community. SC: A colleague asked recently whether thinking about the future is a privilege or a right. Unfortunately, it’s actually a luxury. Many may have the motive, but few have the means or the opportunity. But this is not how things ought to work. Normatively, thinking about futures is everyone’s right. My work is interested in making futures more available, accessible, habitual. It’s about urging people to claim their license to spend time and creative effort there. With this broad mission in mind, participation can look very different from one engagement to another. I think this work is for people willing to ask questions and entertain new ideas about the future. That’s less a demographic than a psychographic—or better, a mindset—that you try to bring out among whoever comes along, by providing opportunities to think differently. Another aspect of “who is this for,” is that currently I do a good deal of work in an education setting. OCAD U has the world’s first academic program in design and foresight, that’s what drew me there. It’s exciting to help spread this practiceto where practitioners are trained. This lets us access a higher leverage point in the system—how emerging designers are acculturated. You try things out by setting briefs and developing methods, then see how a range of different minds adapt and work the process through. The classroom becomes a lab, and students—bringing their own backgrounds and concerns, intentions and publics—extend experimentation into places one might not think or choose to go oneself. I find this a more generative way to work than just doing my own stuff all the time, and it also ultimately makes the work “for” a wider and more flexible constituency. BB: Are your projects provocations, or something else? CC: Each project is an experiment that challenges what our public spaces are fundamentally made of and how they might better reflect what we value as human beings. 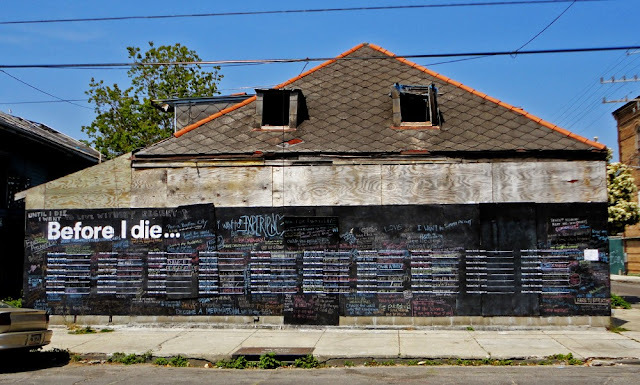 After I lost someone I loved, I went through a long period of depression.I made the Before I Die project as a way to make sense of my grief and find consolation with my neighbors. Their responses helped me more than they will ever know, and I’ve learned just how universal our struggles and desires are after reading responses from Before I Die walls in over 70 countries. I saw even more struggles in the Confessions project. From my experiences, people are yearning for safe spaces to be honest and vulnerable with the people around them. It’s cathartic and consoling. You’re not alone as you’re trying to make sense of your life. You’re not the only one who feels like they’re barely keeping it together. During one of my gloomiest periods of existential confusion,I found a lot of comfort in a book called The Middle Passage by Jungian analyst James Hollis. He said, “In the end, we are only tiny frightened animals, doing our best to survive amid other tiny frightened animals.” This always consoles me. I returnto this sentence when I lose perspective, and it’s somethingI remember when I consider our communities. Our personal anxieties extend into our public life and many of the conflicts in our communities come from a lack of trust and understanding. There are a lot of barriers to opening up and while the barriers remain, it’s easy to forget the humanity in the people around us and become impersonal, and even adversarial. These personal, anonymous prompts offer a gentle first step towards honesty and vulnerability in public, which can lead to trust and under- standing. These are essential elements for a more compassionate society. They’re essential elements for social cohesion. SC: A provocation can spur thought when it succeeds, but sometimes it generates rejection. There’s probably a need to invite or seduce as often as to provoke. I’m interested more and more in projects—and Candy has done many of these wonderfully—that enable people to generate their own ideas, as opposed to responding to ours. The Thing From The Future, for instance, is a card game that my Situation Lab co-director Jeff Watson and I designed. People have used it as a tool for warming up to strategic conversation, for design ideation and prototyping, and as a party game played for fun. This combinatorial prompt generator, as you understand how it scaffolds imagination, becomes very adaptable and useful. We recently released the game under a Creative Commons license so players can customize it more easily to their local contexts and needs. I like projects that offer frameworks for participation and produce surprises. Instead of specifying an experience in every detail, they offer conditions that invite others to grow their own. BB: What does the future mean to you? Is it a worry, an invitation, something else entirely? SC: Ashis Nandy calls futures a “game of dissenting visions.” It’s a gift of sorts, a psychedelic playground where we can make new perceptions and actions possible, and incubate real and far-reaching change. Another brilliant cultural commentator from India, Shiv Visvanathan, invites us to see the future as a commons. I love this idea. Public imagination is the ultimate renewable resource; we are still learning how to use it wisely. CC: The future is something I’m excited to shape with others. I’m interested in the relationship between public space and mental health. The urban historian Lewis Mumford once wrote that the origin of society, the reason we came together in the first place, was not just for pure physical survival but also for “a more valuable and meaningful kind of life.” Some of the first gathering places were graves and sacred groves. We gathered to grieve together, worship together, console one another and wonder together. I think one of the greatest missions of modern cities is emotional communion. Not only does this serve fundamental needs of the human spirit, it cultivates compassion and trust, which are vital for civic respect and collaboration. I’d like to expose more of our interior world in public so attention to mental health becomes less stigmatized. I’m currently creating a public device for philosophical reflection that is inspired by the I Ching. I’m also intrigued by how we deal and don’t deal with death. After anthropologist Ernest Becker wrote the book The Denial of Death in 1973, a theory emerged called terror management. In a nutshell, it argues that legitimate anxiety about our impending deaths was solved by creating cultures that provide comforting arrangements, including the hope for immortality. Immortality can be literal, as in heaven or reincarnation,or symbolic, as in publishing a book or having children. Our current cultures try to give us meaning and value, but they can also distract us and take us away from the deep encounter with ourselves. This helps to remind me that culture is man-made and we can change it. LEAP Dialogues –– all 360 glorious pages of it –– is available to order here.